DISCLAIMER: To give full credit to the organisers all of my images were taken after the initial rush at the beginning of the event. Therefore the tables look messy because at that point they were but at the beginning I was much too excited to take photos of just how lovely the set up was pre-swap. On Sunday 4th October the Black Box bar in Belfast hosted the first ever plus-size clothing swap. 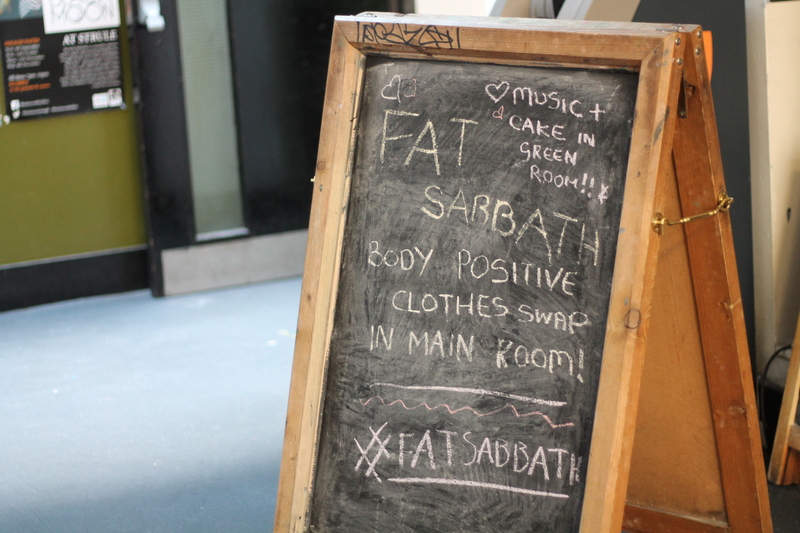 Fat Sabbath was something that a friend of mine linked me to on Facebook a couple of months back and when I read that they were planning a clothing swap day I got mega excited, I have heard of clothing swaps before and thought that they seemed like a great idea but to have one right here in Belfast that was aimed towards plus-size was a super exciting discovery! One of the organisers was a good blogger friend of mine Claire from French for Cupcake who also provided Cupcakes for the event day which were amazing and all the money donate on the day for entry and for the cupcakes all went straight to the Rainbow Project charity. So on the day the doors were opened at 12:30pm so that we could all donate our items receive our swap tokens and help set up the tables full of items, I attended with my mum and sister and together we had about 60 items including clothing, shoes and accessories. Once we had the items checked off everyone helped set up the tables full of items. It was all organised into sizing which made it super easy to find items which were going to work for you. What I loved most about the concept was that it was items that I was going to end up donating anyway and this way I was able to pick up things which I wouldn’t probably have picked up in the shops or items which I thought I could re-purpose for something else. My favourite thing about the event, besides a whole new wardrobe of clothes, was just getting time to talk to girls who are more relatable to me. I actually spent most of my day chatting and laughing with the girls about all things fashion, some of you may be aware that six months ago I moved jobs to work for Evans Clothing as my interest in fashion had moved into focusing on the concept of working within plus-size fashion, so it was just lovely to spend time talking to women that are the same as me, have the same issues with clothing and most importantly were just a lovely bunch of ladies to spend a Sunday afternoon with. 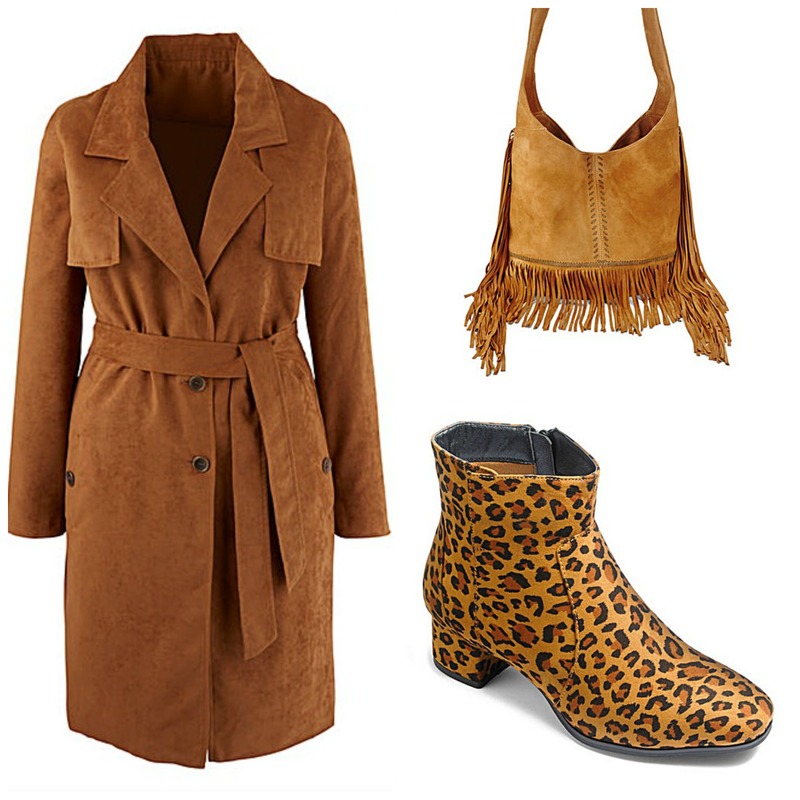 I decided to focus my attention on looking for pieces which I would typically pick-up so I got alot of print, pattern, colour and sequins which I felt would be a great additions and pieces that would make me think more outside the box with my own fashion choices. I think alot of that mentality is down to Netflix releasing the Iris documentary which if you have watched you need to watch it and the Advanced Style documentaries ASAP! I am planning on showing you guys some of the pieces I got but I want to do it through creating a series of outfit posts which I am currently working on, which should be coming up in the next few weeks. I just want to put a final HUGE thank you in her to the amazing girls including Claire and Amy ( I know there are others but I didn’t catch everyone’s names sorry) for making such an amazing event, the space was great for the event and I know everyone that I spoke to during the day was having an amazing time! I have heard rumours of the next event being organised for the new year so I am keeping hold of my left over tokens and cannot wait to see what the next was has in store! WOW launch event: Was I WOWed? Something which I feel that I haven’t openly spoken about on my blog is my change in diet since leaving university. I think anyone who has gone through the final year of a degree will sympathise to a certain extent but in the final months I literally was only focusing on staying up for as long as I could to finish as much work as I could, this lead to my diet becoming incredibly poor and full of high sugar, high calorie, high fat and just generally not what I should have been eating. Since finishing my degree however I have tried to undo this by really switching my diet and exercise routine to actual include an exercise routine into my weeks. 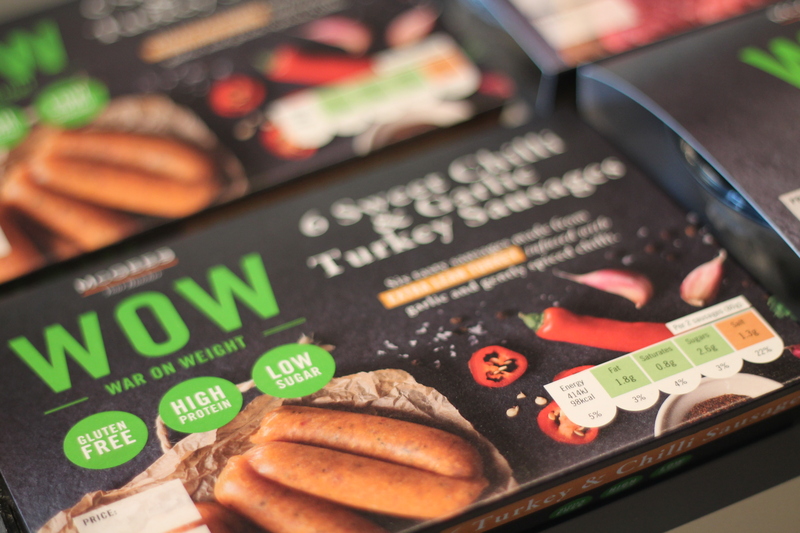 So when I got an email telling me about a new range of low fat, high protein, gluten free products that were coming to stores I became really interested to find out more. Karen Daly and her husband are the brains behind WOW ( which stands for War On Weight) after her own weight-loss journey Karen has devoted her life to spreading the word that good food can taste great and you can loss weight without feeling like you have to give up all of your favourite meals. One point I want to make before going into more detail of the event etc I want to make it clear that I am not trying to make this post advocating weight loss. I spoke at the beginning of the year about being in a good place with my body however finishing my degree was tougher than I could have ever imagined and upon completing all of my work I came out of that post university haze realising that the toll taken on me during the final few months and the rubbish I had consumed had affected my mental health alot more than I was probably willing to admit at the time. 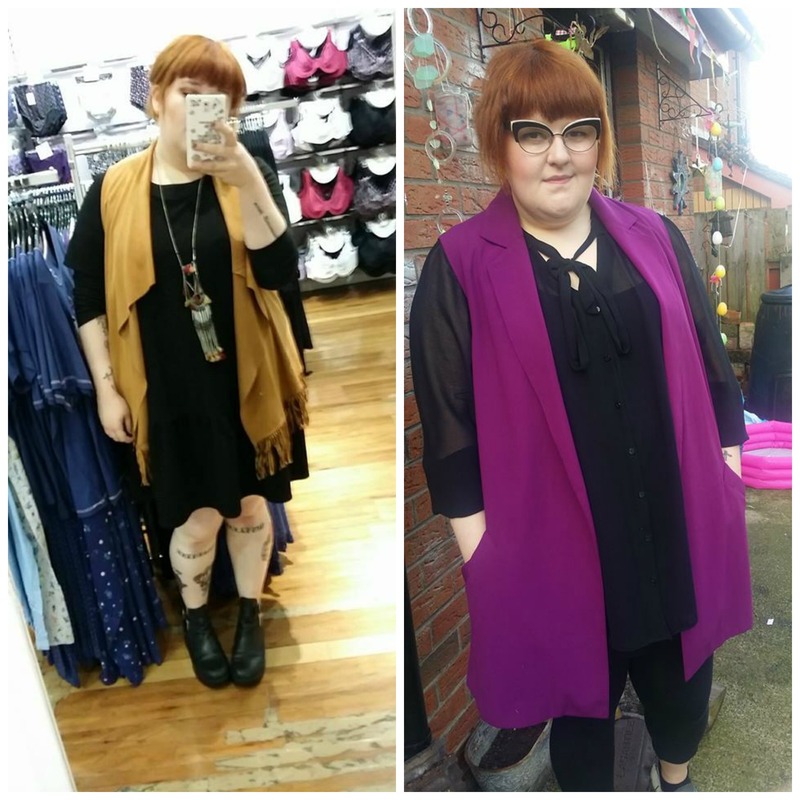 Please read my post from the start of the year to fully understand my feelings HERE I still fully stand up everything in that post but I want to make it clear that I needed to make the changes for me and how my relationship with my body has changed in the last few months and the place that I hope to be with my body within the next few months. I brought my mum along to the event with me because we are on our journey together and we were both really interested to here if Karen gave any tips or tricks which would help our own personal journeys along. On arrival we were given some “skinny” mojitos which were delicious and a great accompaniment to the food later on. The event was held at Cast and Crew Belfast which is situated nearly opposite the Titanic Museum. Now anyone who knows the area will know that the Belfast Met campus which I studied at is right beside Cast and Crew, I really wish it had been around when I was studying because it is a lovely little cafe with a cool edgy look and if last night was anything to go buy I can imagine the food is probably great to! After we had the cocktail welcome we waited for the BBQ to heat up so we could try out some of the products from the range. We got to try the steak burgers as well as a sausage with garlic and sweet chilli, both of which were delicious and really filling despite being so low in fat. This was all accompanied by a lovely fresh side salad and the option of a feta cheese salad. Mum and I both couldn’t get over just how lovely the food was and that we definitely wouldn’t have been able to tell the difference between these and a higher fat option. One thing I have noticed in recent months is how when you get a meal which is either lower fat or slimming that the flavors don’t tend to be as strong, now this is not the case with everything but I was really WOWed by just how nice the food was. After we had chance to have our food event host Cathy Martin and WOW founder Karen Daly talked us through the whole range which at the minute consists of eight products, which include 4 meal options for example stir frys and meatballs and 4 meat options including both of the items we sampled on the night. Karen also talked us through the benefits of the products and how they can work into your diet. It was a very interesting night and mum and I both left feeling like we had learnt some interesting facts that we want to incorporate into our own diet. 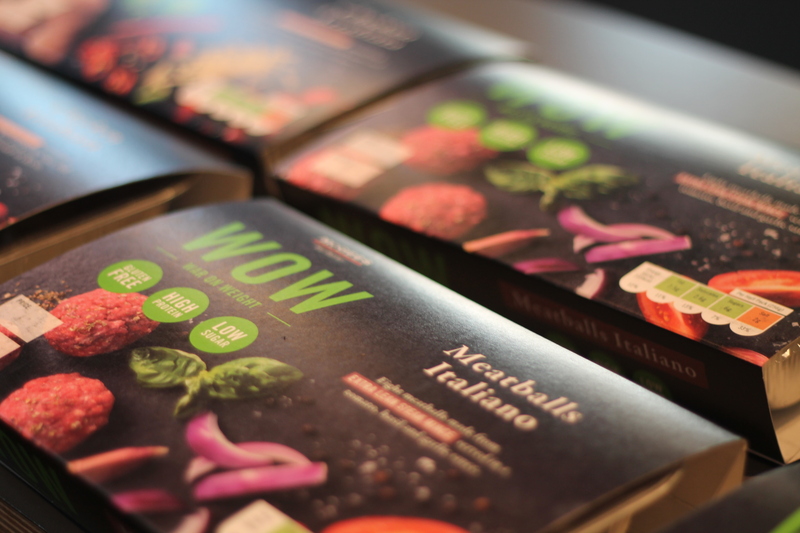 A massive thank you to team WOW and CMPR for letting us walk away with some of the products to try for ourselves at home, I know we are looking forward to dinner for the next few nights!